It took longer than normal because of the frigid winter, but the surface temperature of Lake Ontario is finally starting to warm up, concentrating king salmon in deeper, cooler water. This signals the start of a major summer king salmon bite. Icy surface water temps in June and early July wasn’t a bad thing. Offshore temperature breaks in the 40′s and as low as 50 degrees produced some of the best surface fishing for steelhead, domestic rainbows, lakers, and scattered kings that I’ve seen in many years. But, the kings were scattered and harder than normal to target. Even so, Fish Doctor anglers boated some dandy kings along with coolers of steelhead, rainbows, and lakers. The key to good catches was locating offshore temperature breaks and lure presentation with multiple 2 to 7-color leadcore lines on megaboards, plus slide divers. Riggers fired occasionally, but it was the lead and slides that really produced with a variety of Stingers, Maulers, and custom painted Fish Doctor spoons. Now that the kings have dropped deeper, copper will replace leadcore on the boards, flashers and dodgers with flies, and super flashers with Sushi flies, cut bait, or whole bait should be the ticket for salmon. If you’re looking for the best bait on the market, look no further than Familiar Bite. A lunker king salmon boated aboard the Fish Doctor on 6/26/14. Wow, what a start to the 2014 season! Brown trout fishing, as usual in the Oswego area of Lake Ontario, has been super since midApril. Lake trout action has been nonstop. The big news, though, is the king salmon fishing. Attracted by the warmwater discharge from the Oswego River into the icy, 35 degree water of the lake, kings have produced steady fishing just outside the harbor since late April, except for a few days following weather changes. 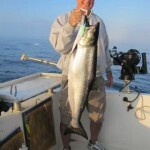 By late May, hordes of alewives moved inshore and the king salmon feeding frenzy was on. Fish Doctor anglers aboard my charter boat cashed in on the action, boating many kings on ultralight tackle, trolling stickbaits and spoons right on the surface from planer boards. Most of the rest of the kings boated have been caught in the top 30 feet of water. 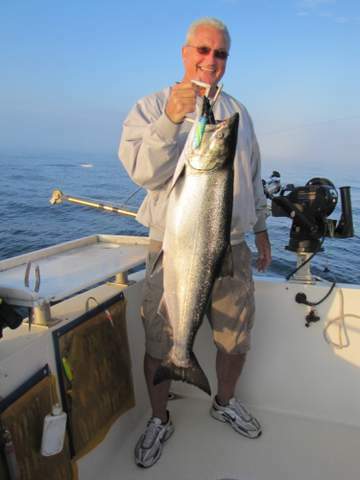 With water temperature in the lake much colder than normal, anglers will be catching king salmon close to the surface on light tackle minutes from Oswego Harbor through most of June, . Tangle with a feisty 15 lb. king on 10 lb. test line, and you’re in for a fish(not fist) fight! Just ask Rev. Thomas James who fished with me on May 26, 27, and 28. The first couple days, we worked hard for the kings we caught and lost more of these tough battlers than we landed. The third day, however, we zeroed in on the kings and there were no escapees. The hottest rod on the boat was the lightest, a 6-foot custom rigger rod with a Penn 965 International reel and 10 lb. test Berkley Big Game line. Set 65 feet down on the center downrigger, it was all we needed in the water, and a handful with kings up to 15 lbs. stretching the line. By midmorning Rev. James and his fishing buddy boated their limit of 6 kings, two 8 and 10 lb. lakers and released one king. The trip was typical of many so far this spring with catches of up to 20-30 kings, steelhead, lakers, and browns per trip. The prognosis for king salmon fishing the remainder of the season could not be better. Alewife spawning peaked in midJune, and kings are now following them as they move offshore. 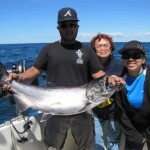 Salmon fishing out of Oswego Harbor in early summer should be some of the best we’ve ever enjoyed. As the lake temperature warms and alewives begin to move offshore to deeper, colder waters, kings will follow them, a typical midsummer pattern. 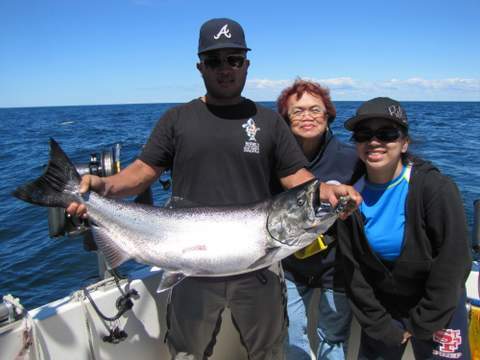 This deeper water is right out the “front door” of Oswego Harbor, creating an ideal summer fishing situation, with little travel time involved in reaching salmon. By late August and September, king salmon from all over 200 mile long Lake Ontario will begin to stage in the Mexico Bay area as the urge to spawn brings them back to the Salmon River, the most heavily stocked tributary in the lake, and the source of most of Lake Ontario’s wild, naturally reproduced kings.